The Sakura Blossom Panel Quilt is all done now and available for purchase! 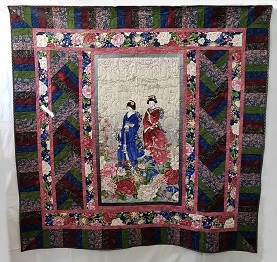 This beautiful Asian style quilt has a panel with Geisha girls in the centre and easy borders in matching colours and florals. The braided border is easily done with strip pieced squares and clever cutting. The borders have photographed a bit dark on the website picture, they actually blend and match beautifully. You can purchase this from the website or in the shop and can choose either the panel, pattern, or kit which includes all the fabric to make the quilt, plus backing and binding. Another lovely panel we have is the one called My Happy Place and this features a sewing machine with threads, happy sayings and other items in blocks around it. It’s in soft aqua and pinks and could easily be adapted for a sewing machine cover or wall hanging. The Peacock Panel quilt kit is still available and has been quite popular. It’s a similar pattern to the Sakura Blossom Quilt but looks quite different done in all the blue shades. It has the lovely peacock panel in the centre and plenty of blues and florals in the borders.